This post was created by Catherine Allen-West. As of October, the latest national polls, predicted that the 2016 Election results will reflect the largest gender gap in vote choice in modern U.S. history. Today, according to NPR, “An average of three recent national polls shows that women prefer Clinton by roughly 13 points, while men prefer Trump by 12, totaling a 25-point gap.” If these polls prove true, the 2016 results would indicate a much larger gender gap than what was observed in 2012, where women overwhelmingly supported Barack Obama over Mitt Romney. 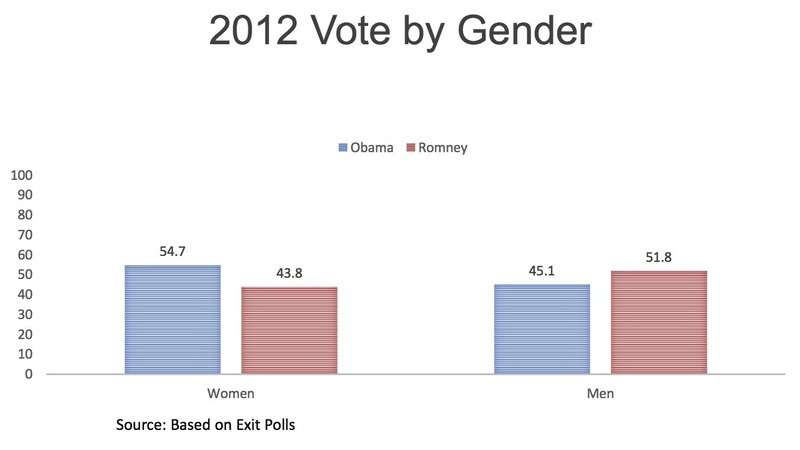 2012 vote by gender based on national exit poll conducted by Edison Media Research. University of Texas at Austin Professor Tasha Philpot argues that what really may be driving this gap to even greater depths, is race. 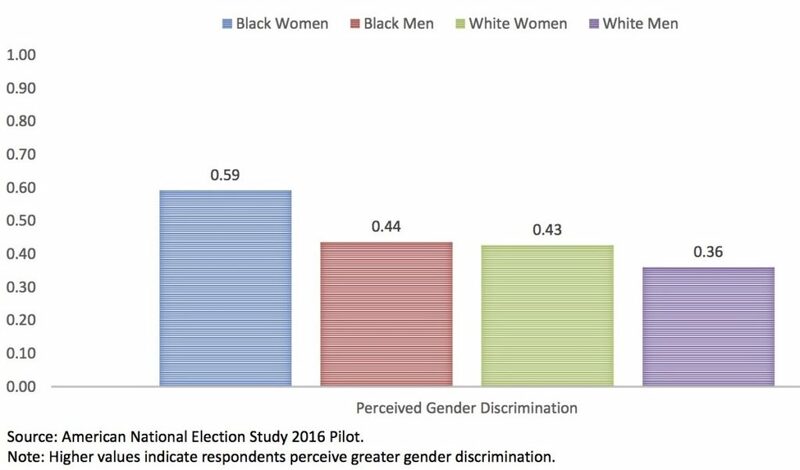 For instance, here’s the same data from the 2012 Election, broken down by gender and race. 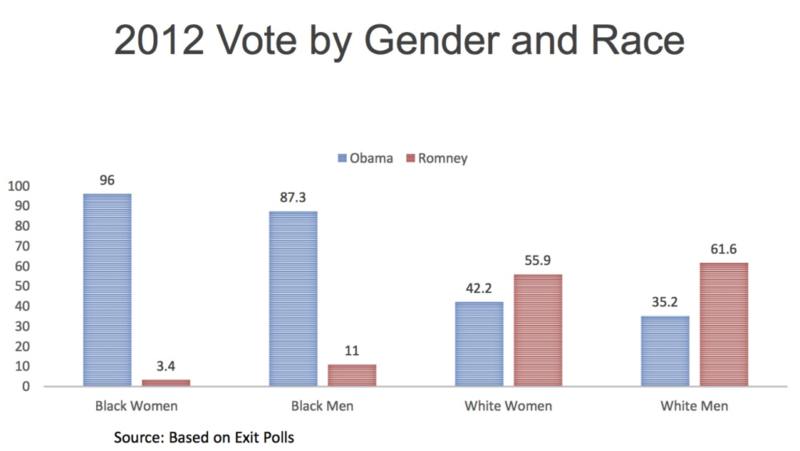 2012 vote by gender and race based on national exit poll conducted by Edison Media Research. Often overlooked in the discussion of the gender gap, race figures prominently into many American’s political identities. 2016 Gender Gap in Party Identification. Philpot recently participated in the panel “What We Know So Far About the 2016 Elections” at the University of Michigan’s Center for Political Studies. In her talk, “Race and the Gender Gap in the 2016 Election,” Philpot outlined the potential sources for the gender gap and emphasized the role that race is playing in widening the gap. Using data from the ANES 2016 Pilot Study, Philpot compared opinions from white and black men and women on several issues such as government spending, inequality and discrimination, and evaluations of the economy. While there were noticeable differences strictly between men and women, the real story became clear when Philpot sorted the results by gender and race. 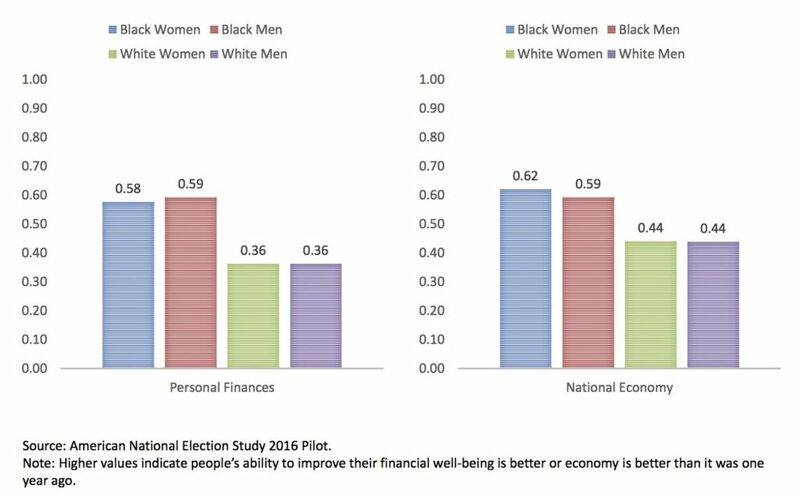 Small gender gaps exist among both whites and blacks, but the most remarkable difference of opinions on all issues is between black women and white men. 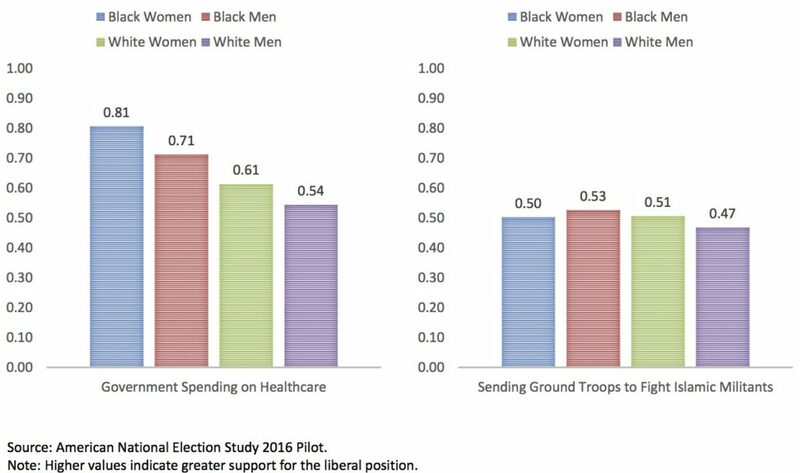 2016 Gender Gap in Spending on Healthcare and Defense. 2016 Gender Gap in Economic Evaluations. On most issues, black women and white men fall on opposite sides of the political spectrum. Philpot concludes that it’s an oversimplification to consider the gender gap as merely a gap between men and women, when, in reality, the observed gender gap is largest between white men and black women. This entry was posted in ANES, Elections, Gender, Race on November 4, 2016 by Catherine Allen-West. Great insight. Well documented conclusions. I wonder what the education gap is (high school v. College educated among men and women?